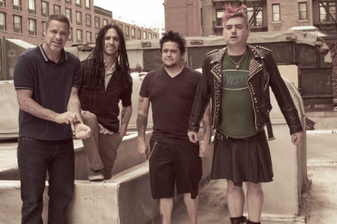 Let’s be real: What’s really left to say about NOFX? For over thirty years the reigning kings of punk rock have remained relevant by continuing to push the boundaries of their music, lyrics and good taste in a way that’s as endearing as it is infectious. For that reason it’s remarkably apt that the band’s latest LP First Ditch Effort is also their thirteenth because ominous black clouds hang over this collection of songs that see frontman/bassist Fat Mike exploring self-loathing and mortality in a more raw and honest way than he ever has before. Mike credits much of this to the writing process behind NOFX: The Hepatitis Bathtub And Other Stories, the band’s New York Times Bestselling memoir that forced him to confront his ghosts and revisit his past in ways that weren’t always comfortable. 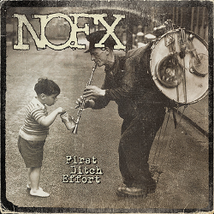 Despite the fact that NOFX helped invent melodic punk music (alongside their longtime peers such as Bad Religion and Rancid), they’ve never made the same album twice and First Ditch Effort sees them continuing to push their own musical boundaries. “One of the things I’m proud of on this album is the song ‘California Drought’ because it’s written in a rhythm that I don’t think anyone has ever used before and we have a drum solo on that song,” he explains as if he can’t even believe it himself. Fat Mike also adds that spending the past few years working on his musical Home Street Home helped subconsciously influence this album, whether it’s via the fully formed harmonies or prevalence of piano. “I’ve written so many crazy songs for the musical that even though NOFX didn’t have a mold I keep pushing barriers,” he responds when asked why this album sounds so inspired. Fat Mike also credits producer Cameron Webb (Motörhead, Alkaline Trio) for helping make these songs so dynamic. “Cameron had a lot of ideas that I would have never have thought of when it came to arrangements,” he explains. In fact the band were so inspired that they wrote eighteen songs for the album and even came up with some ideas when they weren’t even trying. “The song ‘Ditch Effort’ just came out of nowhere from us jamming,” Fat Mike recalls. “That’s not a normal thing for us but we just started playing and it had so much power and it felt so good to play it together so we had to put it on the album.” The band also prove that they haven’t lost their innate ability to craft a hook on First Ditch Effort and the conspiracy theory-rich “Sid And Nancy” and self-reflective rocker “I Don’t Like Me Anymore” are two of the band’s catchiest tracks to date. After battling skinhead punks in the eighties, major-label executives in the nineties and George W. Bush in the early 2000s, NOFX are finally ready to enjoy the success they’ve been too preoccupied to embrace in the past… and it’s turning out to be pretty exciting. “I went out with El Hefe the other night to a party and I think it was the first time we had ever hung out socially and it was a ton of fun,” Fat Mike recalls. “I think the process of doing the book and the book tour and making this record has brought the four of us together and formed a bond that we never would have discovered otherwise,” he summarizes. That newfound revelation is inherent in even some of this First Ditch Effort’s darkest moments making it the perfect soundtrack to both a fresh start as well as the end of the world. As the band have undeniably learned over the past 33 years, sometimes it’s just all about your perspective.